"If you own ANY type of health and wellness orientated business then what your about to read is your "million dollar briefcase"
Own a PT, martial arts, yoga, massage, gym, or any other type of fitness/health and wellness orientated business/ want a LOT more new members clients? Greetings Dear Fitnessprenuer! If you’re not a regular reader of my newsletters then firstly a little about me. Some of you reading this may already know me. Perhaps I've done a promotion for your business in the past. We have been responsible for some of the most successful marketing promotions ever done in Australia and while I personally no longer travel from gym to gym running telemarketing promotions I am absolutely passionate about the health and wellness industry, both in helping the "guests" I personally sell to (yes I actually do sell gym memberships I like to keep a "hands on" approach in my work) as well as my clients that purchase my products. The other hat I wear is being the marketing manager of Definition Health Club I assist in running all the internal marketing as well as my business being involved with telemarketing services (including staff telephone sales training) that provides the club a constant year round source of leads. In one of the harshest and yes despite what our political "leaders" spin to us times are tough, I personally work with a centre surrounded by 12 other gyms within a 10k radius. It's one of the most competitively saturated markets I've ever seen, yet despite that we continue to experience growth and I can show you how your business can continue to gain more new clients or members without shelling out on useless on ads in the paper (break even or in most cases lose your money) or other ineffective "pay and pray" marketing methods? 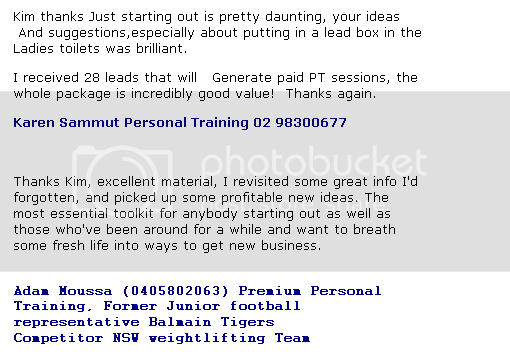 Would you like to gain lots of new clients or members by arguably the BEST telemarketer and fitness marketing consultant in Australia? No we're not saying that to brag simply Google "Kim Martin Fitness Marketing" without the quote marks and you'll see what I mean! I own a number of websites that sell both fitness orientated products I've created as well as informational "toolkits" designed to show anyone that operates a gym, PT business, yoga, martial arts, massage, meditation or any other health and wellness business how to generate new clients. And I know that you do NOT need to spend money on expensive marketing promotions that are NOT targeted towards the specific demographics of your market just because the local paper rep wants a commission and think "he knows best" about what will or will not work for you. Understand truth is advertising reps are NOT marketers skilled in writing or understanding "direct response copy" The are in no position to advise you on the best ways to generate business. If you use and implement what's in "fitness marketing strategies" and combine that with lanas telemarketing you WILL get more business..Period! For this to work and work really well for you You do need to have an open mind, be open to implement simple strategies. Personally you would preferably be on a "continuous learning path" by reading listening and using ideas that seem unconventional and understand that it is possible to continue to grow your business in ANY economy with some "street smart" marketing and hard work! Feel free to contact me and I'll immediately give you FOR FREE a method that costs $5-$10 BUT will consistently out pull half page $500 adds in the local paper time and time again! We still use it this as a primary way of generating POS (point of sale leads) as well as referrals It is shockingly simple-like most good ideas! Would you like to find out just how powerful telemarketing and direct response marketing methods can be for your business? This is your chance to pick up 3 hours of telemarketing done by a "gun" telemarketer, you can hear her live working with our club further down the page. The "Noahs Ark" mentioned in the above reference will gain you upwards of 5 new clients ALONE in the FIRST week using this method. While I'm obviously not going to go into specifics its 5 different strategies that will not cost you one cent to implement, and that can be IMMEDIATELY put into use if you own a gym, personal training, martial arts or any other type of business that has multiple clients attending at any one time. Specific Types Of Phone Calls- Both Inbound And Outbound. How to generate more leads, set more appointments and obtain more referrals through specific telephone strategies. 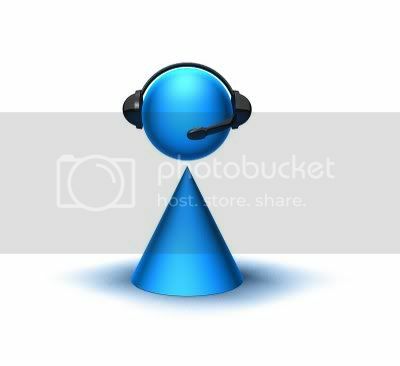 The Outbound or "Cold Call"
The script development and revision tailored specifically for your business along with a detailed training report on how to use and follow up no shows cancelled etc You'll also get an sheet listing EVERY call made and the result! Here's what Australia's top telemarketing sales trainer had to say after a keynote address I made to an "Excell Group"
Reference from Jenny Cartwright Australia's top telemarketing sales trainer, speaker and author. That's not a missprint all the above for $397. So why should you spend a $397 with me? Good question. As I said above simply Google the name Kim Martin Fitness Marketing. I've worked with centres all over Australia (and made them a LOT of money) I also still work in a "hands on" role at Definition fitness centre in Blacktown. This isn't a job its my calling. And if you're wondering why I'm doing this? Simple things are slow and this is a "loss leader" to me. Meaning after setting up costs I make very little, BUT I'm banking on you using what I have either after the promotion or carrying on (at a good rate) if things go really well for you. Upon purchase you'll get a phone call from me to set up your promotion and I'll post all the rest of your goodies for free via a yellow express post bag. Normally about one working week to get everything up and running. Now go and hit the buy button now and lets get some business happening for you! The recording is one sided (you will hear Lanas voice only) as it is illegal to record a conversation without permission from the other party-these are genuine "cold" calls made to the Blacktown area and a statuary declaration is available to that effect. This is Lana calling for us but you'll get the grasp of what she does in 10 minutes. She did not want to be filmed so you'll just hear her voice-LISTEN to the way she engages the person on the other end of the line, this recording is priceless by itself. She is a lead generation DEMON!